PINK & Girly with a bit of bling !!!! http://inthepinkchallenge.blogspot.co.uk/..my embosssing is in the frame not very clear so might not count ..never mind though eh!!!! Fab GDT card love the bow & sparkles! Congrats on your GDT spot Sassy. Your card is gorgeous. I love the sweet image and wonderful pretty detailing. Gorgeous card Sassy, I like the image the colours and the embellishments. 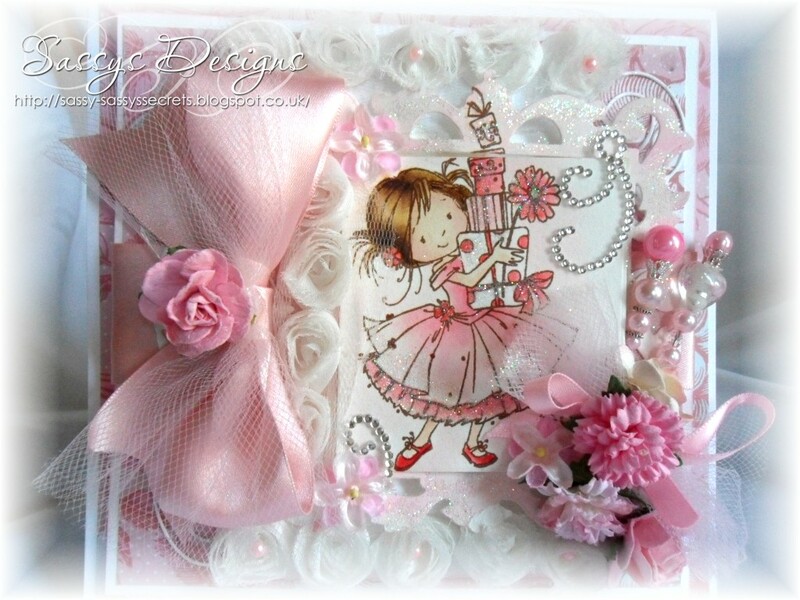 Oh so girly and so sweet card ! Love the big wow, love pink, superb creation ! Hi sweetie this is sooooooo incredibly beautiful as always hun. Love the image & love the lush pink colour. Hope you've had a lovely weekend my sweetie. A vision of pink pretty fluffiness! Love it! This is so beautiful Sassy and congrats on your GDT!! 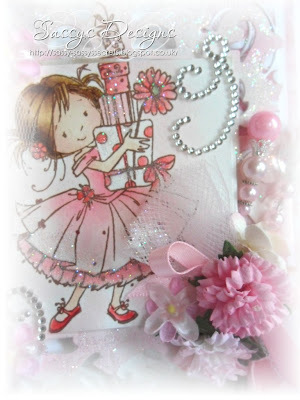 Hi Sassy - what a beautiful girly card. The colouring and embellishments are fabulous. Thank you for entering the embossing challenge at In The Pink, however, there doesn't seem to be any embossing on your card, and there is no link to ITP in your post! Please correct me if I am wrong. Hi again Sassy - thanks for adding the link to ITP, and for pointing out the embossing! Wowwww Sassy this is mouthwateringly beautiful, there is such an abundance of beauty to see, the image and embellishments are spectacular, I am in awe. Gorgeous card Sassy! Love the colours and all the beautiful details - the pins are lovely! aaaaw bless, she is soooo sweet! And guess what?! I'm possesing many of those lush pins too now, an angel sent me some on me b-day!!! Lucky me, aren't I? As sson as I have some time I will post it on me blog! Sassy, this is just gorgeous! Love your colouring the design and all that luscious detail. Fabulous! Thank you so much for joining in with out pink challenge at Dream Valley. Sadly your fabulous card is not eligible for our prize or top 3 spots as you have neglected to even mention us in your post.